Enabling your mobile workforce is not a one-time effort but a journey. Various mobility considerations will undoubtedly come into play requiring IT to make decisions around what enterprise mobile apps to roll out to various employees and with what kind of access policies. Do you need to deliver mobile device access to existing web applications? Do you need to develop new native mobile apps – for your employees or your customers? And then what’s the best way to manage and secure these mobile apps? 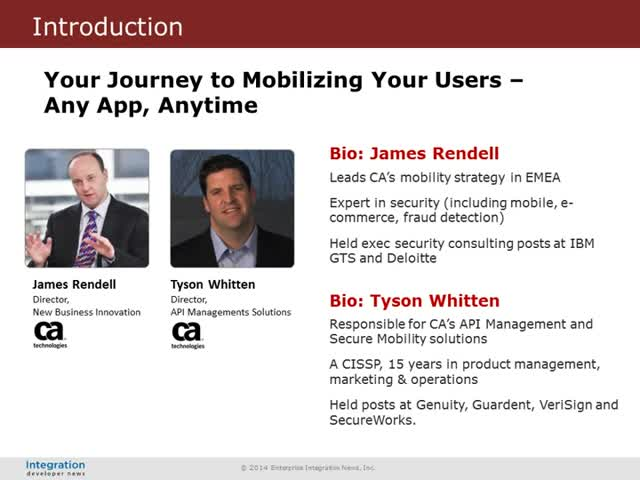 Please join James Rendell and Tyson Whitten from CA Technologies as they provide customer validated recipes for securely enabling your mobile workforce, while covering everyday use cases for mobile app development, management and security. Many organizations do not have a Mobile App strategy – but they should! Join James Rendell, Sr. Director, Technology Strategist, CA Technologies as he explores the importance of an enterprise Mobile App strategy and why you should implement one at your organization. In the enterprise space learn how deploying Apps on users’ BYOD devices can drive broader Transformation programmes by providing improved ways to enable users to engage with core business processes and subsequently improve overall compliance, and in the B2C space learn about the strategic importance of an App Strategy for reaching new markets, with new products, through new channels. 2014 was a year of major consolidations and coming out parties for some major players in enterprise mobility. While Enterprise Mobility Management kept evolving, the race got even more furious with mobile app analytics. Getting insights into various aspects of mobile apps development, app performance, app retention and user loyalty are getting ever so critical in light of the furious pace with which the mobile App Economy is shaping up and defining ubiquitously mobile work-styles. Hear from Arun Bhattacharya, Sr. Director of Mobility Product Marketing at CA Technologies, how 2014 went and how the coming year might line up. Enabling your mobile workforce is not a one-time effort but a journey. Various mobility considerations will undoubtedly come into play requiring IT to make decisions around what enterprise mobile apps to roll out to various employees and with what kind of access policies. Do you need to deliver mobile device access to existing web applications? Do you need to develop new native mobile apps – for your employees or your customers? And then what’s the best way to manage and secure these mobile apps? Please join Arun Bhattacharya and Tyson Whitten from CA Technologies as they provide customer validated recipes for securely enabling your mobile workforce, while covering everyday use cases for mobile app development, management and security. Do your EMM investments evolve with the times? Do you feel like you just have an MDM solution and have the need for new innovations to address today’s challenges? Want to learn how to extend your current investments into the future? We keep hearing about the Internet of Things (IoT), but what does it really mean for businesses today and in the future? Join James Rendell, Sr. Director, Technology Strategist, CA Technologies as he discusses the importance of the Internet of Things and the unprecedented scalability challenges that come with it. Learn about the challenges and opportunities the Internet of Things will mean for tomorrow’s enterprise and what you can do today to prepare for these changes. Managing all devices being used across the enterprise can be challenging. Most enterprises have very complex environments with a mix of desktops, laptops, servers, virtual machines, alternative devices, BYOD and the proliferation of mobile devices. Please join us to discuss the importance and challenges of implementing a unified endpoint management strategy and how to leverage a unified endpoint management solution and the resulting benefits that meet the new enterprise level device management needs. Mobility is everywhere and yet it’s still just beginning. The rapid growth of data presents both immense opportunities and immense risks; resulting in security being paramount for the modern, mobile business. The DevOps movement can help IT better meet these demands. Examine how two new booms in mobility, wearables and the Internet-of-Things will demand the speed and agility of a DevOps approach and affect how you do business. Mobile applications offer new revenue streams, a direct channel to customers, and an exciting new experience for developers. Join Jonathan Lindo, VP Enterprise Mobility at CA Technologies as a panelist on the Gigaom Webcast: Reclaiming Control of Mobile Development with Devops to examine the impact mobility has had on application development and the role automation, DevOps and other rapid development tools play in moving IT from inhibitor to enabler. Join James Rendell, Sr. Director, Technology Strategist, CA Technologies as he explores the common pitfalls organizations experience while managing their mobile enterprise risk and security. Hear practical advice on how you can avoid the same issues and learn how Smart Containerization can make it easier for organizations like yours to implement security policies. Wait- you do not have a security policy - then you definitely want to attend this live interactive session to learn why a security policy is an imperative. Gigaom panelist and Vikas Krishna from CA Technologies will examine the current state of enterprise mobility programs and the reasons behind them, discuss the untapped potential of a properly executed mobility strategy, and outline concrete steps and examples that businesses can take to reboot their own mobility efforts. Envisioning how mobility will transform your business in the near future and beyond can be difficult, however there are practical strategies you can adopt today that will help accelerate your mobility transformation. Join Arun Bhattacharya, Sr. Director, Enterprise Mobility, CA Technologies as he discusses the core tenants of a successful enterprise mobility strategy and provides practical guidance for business and IT Leaders on how to manage their businesses’ mobile future. Mobile computing is changing the way we think and behave, and is leading us to change the way we work. Consumerization and BYOD have already taken hold, and the influx of new devices and mobile applications into the enterprise opens up new challenges and possibilities in terms of transforming business processes. Join guest speaker, Richard Absalom, Senior Analyst, Enterprise Mobility and Productivity Software at Ovum as he discusses three key trends that are changing the way we do business. Attendees will also learn insightful tips on how to best embrace mobility in order to take full advantage of this fast-developing opportunity. Mobility has increased management and security demands while robbing the IT department of much of its power to enforce policy. Modern CIOs must decide not whether to support an ever-widening range of devices and apps but how, without disrupting ever-more-powerful lines of business. Early bucketed attempts at enterprise mobility management have yielded mixed results. Pure mobile device management (MDM) approaches have provided excellent baseline security and device awareness, but they have proved a blunt tool for other needs. Mobile application management (MAM) technologies have added security with minimum impact to users’ workflows, but they do not provide a comprehensive view of the user device. Neither MDM nor MAM — alone or together — provide IT the resources they need to fully manage and support users. While mobility promises to make the enterprise more productive in the long term, its rapid evolution has slowed the arrival of a true, comprehensive management solution that provides the control, flexibility and reporting businesses have come to expect in traditional IT management. 1. How can IT keep pace with change without compromising manageability or security? 2. What are the disconnects between current EMM tools and business needs? 3. What are key considerations for mobility outside the security bubble? 4. How suited are traditional unified management tools for mobile devices and users? 5. Who are the stakeholders and how must IT integrate them into decision making? 6. What is the future of mobility management? Enterprise mobility management is about more than just getting handle on the flood of BYOD devices coming into the organization. It is about managing the explosion of new devices, applications, content and transactions, which threatens to overwhelm IT managers. The sooner you address the need to holistically manage this complexity, the better positioned you'll be to take advantage of the mobility revolution. Cutting-edge organizations are adopting comprehensive mobile strategies that balance connectivity for employees and customers with a secure, flexible supporting infrastructure. Our panel of experts will help you understand how to develop effective strategies that accelerate mobility transformation and prepare your organization for the mobile future. End-users have become increasingly tech savvy and now demand the same consumer-quality experiences when it comes to enterprise mobile applications. Join James Rendell, Sr. Director, Technology Strategist, CA Technologies as he discusses why the mobile end-user experience is a critical element of a successful enterprise mobility management strategy and how organizations can ensure increased innovation and performance of their workforce. Join Arun Bhattacharya, Sr. Director, Product Marketing, Enterprise Mobility, CA Technologies as he discusses the core tenants of a successful enterprise mobility strategy and provides practical guidance for business and IT Leaders on how to manage their businesses’ mobile future. Jack Madden converses with James Rendell to get the CA perspective on Enterprise Mobility Management’s (EMM) future potential. EMM must not forget BYOD but also go beyond it into Mobile App Management (MAM) and find ways to keep users personal information and employers information separated and find a way to embrace the Internet of Things. Jack Madden discusses Enterprise Mobility with Arun Bhattacharya to get the CA perspective on the way it should be. This means going beyond BYOD and MDM, and embracing MAM, MEM, MCM, and IoT. For many companies, finding the balance between employers and users privacy and security has been a problematic issues. Join us for one of our insightful live or recorded webcasts featuring industry experts and practitioners as they discuss how mobility is changing the world. Learn how you can lay the foundation to successfully manage the proliferation of internet-connected devices today and tomorrow.